Calling all gamers! 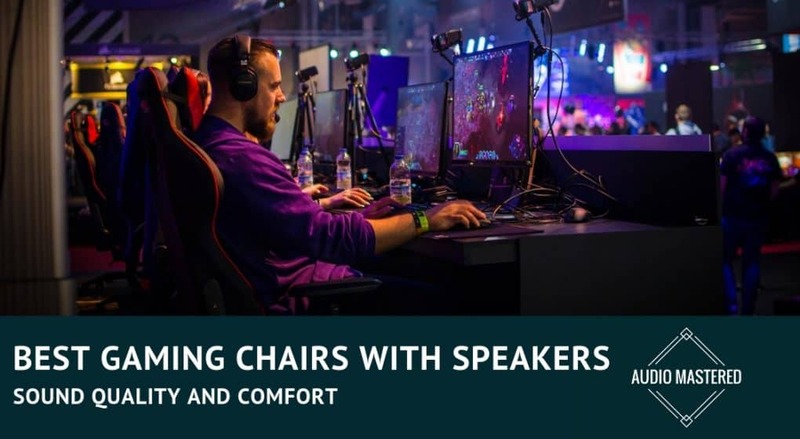 Do you need an ergonomic chair that will help you stay comfortable for long streams and sessions with friends, and that enables you to hear the sounds of the world around you? Having a speaker in your chair can be the difference of hearing an enemy and not hearing one, and the line between victory and defeat for your team. Don’t get left in the cold-take a look at our best gaming chairs with Bluetooth speakers and get ready to game in comfort and style. Skip to the Buyer’s Guide to see what you need in a chair. When choosing a gaming chair, look for the following types so that you get just what you need. They do make a difference, after all! 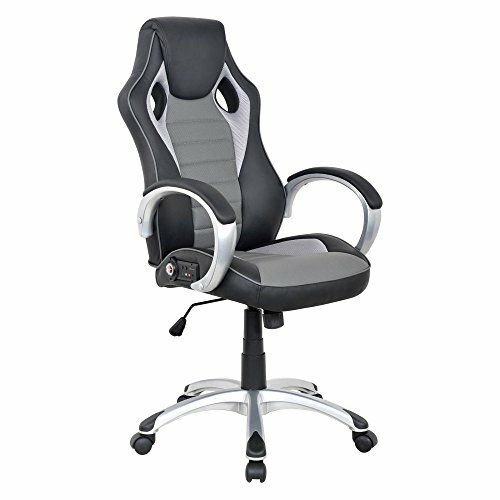 Racer Style Chairs: This combines the standard office-chair ergonomics with a bucket seat that you get in a race-car or sporty sedan. The original chair was debuted by DXRacer in 2006, who started as a manufacturer of seats for luxury car brands. Rocker Chairs: These cool chairs sit right on the floor and have a sleek, curved design about them. They sit right on the floor and they are great if you have carpet and cannot easily slide your chair around. You can stretch out your legs. PC Gaming Chair: If you’re a PC gamer, you are going to need an office-style chair that may be like the one you use at work. You have to be able to sit comfortably for long periods of time, so get one that has comfortable armrests, a backrest, and maybe even a neck rest so you don’t get uncomfortable when it’s time to get serious. Pedestal Chair: These are cool futuristic chairs that sit up off the ground a bit. They look really good and are not so low to the ground. They are great if you want a chair that’s easy to move around, but also helps you stay in one space without sliding around as you would with a rocker chair. Without further ado, let’s show off the best in each category for your purchase convenience. MUSIC GAMING CHAIR: Original designed with Bluetooth speakers. You can connect it to your smartphone, tablet or other Bluetooth-enabled device and enjoy your favorite tunes wirelessly. These two speakers on the back deliver remarkable stereo sound out loud in clear,full audio. 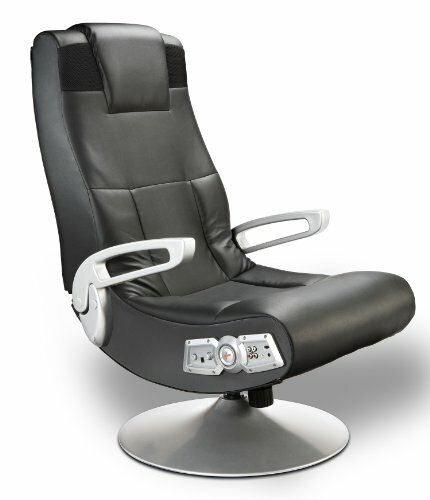 ERGONOMIC DESIGN: Strong metal frame designed to help promote a comfortable seated position. Thick paded back & seat take this chair to the next level of comfort. 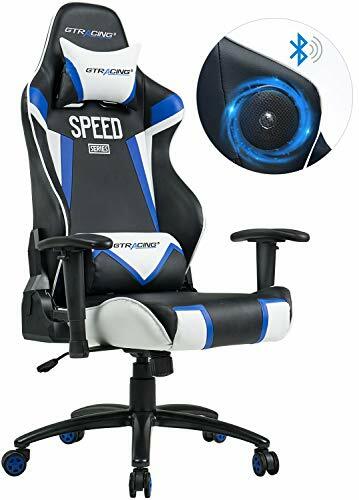 Best For: Serious gamers only who need a quality chair at a fair price, or people who like comfort. I love this chair because the comfort was evident when you sat in it. Other users even stated that the chair felt like it should cost more than it did! 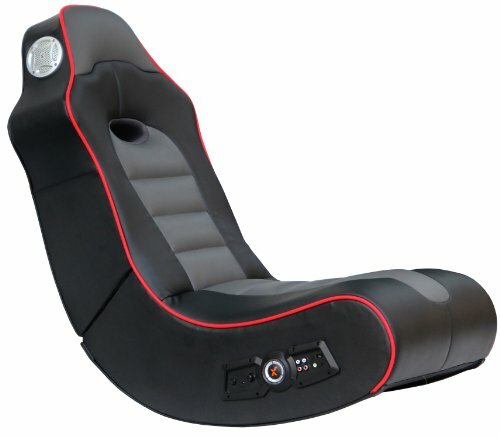 The headrest is very comfortable and will ensure your gaming experience is easy on your back. You can get it in some cool colors to match your setup. It was easy to play a couple hours’ worth of CS:GO sitting in this chair (check out my favorite headsets for CS:GO here.) The speakers are positioned just right on the head so you can hear everything. Super comfy and durable, holds 400 lbs. Hard to adjust the forward pitch of the chair. Best For: People who really want great sound quality in all they do – movies, games, music. This cool chair captured our hearts with its audio. Its 2.1 sound immersion experience had us impressed. The audio signals come in easily from any device that is Bluetooth enabled, and there are even some optional cables included with the chair, too. You can use your headset to play any music you like, and there are separate controls for volume and base. The design goes well with your back, and you can even connect many of these chairs together to make the experience even more personable. Your console will connect easily through the Bluetooth audio. Padding wore down fast for some users. 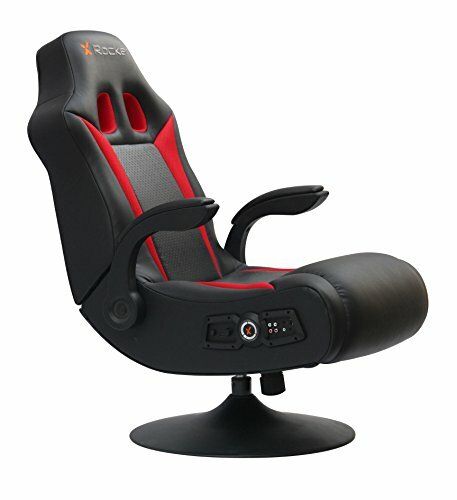 Best For: adult gamers who need a chair that looks cool and slick and is comfortable. This is a chair that is a lot like that one jacket you have – it goes from the office to the dinner with friends and still looks professional and cool. That’s how it is with this gaming chair. It comes in cool neutral gray tones, which let it match any office environment whether that means a place at home or a place at work. You will love the 2.0 Bluetooth speakers – the sound quality is actually quite good. Also, the tilt and swivel features on this chair accommodate all styles of sitting down. You will also like that the speakers turn off after a period of inactivity, great if you are forgetful like some of our people are. You can also make the back taller or shorter depending on what your height is-so, don’t fear if you are a tall person! We noticed the right speaker kept cutting out on us from time to time. One user reported a short in the speaker upon first use. No other colors to choose from. Great For: Kids at heart, and kids in general. This chair really took us all by surprise when we started testing it out. One of the fellows on our team is 5’11” and weighs about 210 lbs. He was a little worried being a bit on the taller side, but we were pleasantly surprised at how easy it was to put this thing together and how well it supported his weight. Not only did we sit back and play way too many rounds of Mario Kart in this thing, we also enjoyed how easily it reclined back for general relaxation like reading, practicing guitar, or just closing your eyes for some rest. The Bluetooth connected very easily with all of our devices, even our PS4. It was great to hear the sounds of VR chat coming through crisp and clear. We wished we could have chosen some other colors, although the chair itself is just fine the way it is. Some users reported arms had to be re-bolted as they felt weak. We have another great pedestal chair here that features Bluetooth capabilities. This chair is really comfortable for extended gaming sessions on the console end of things – in our experience, we sat around playing Rainbow Six for a good four hours before realizing how much time had passed. Everybody who sat in this chair really liked what they felt. I heard basically no complaints about the way the chair felt. That being said, nothing is perfect. You can even use the side panel to plug in your headphones to the PS4. The sound and clarity on this particular chair is pretty good for what you’re getting! Assembly was pretty easy for us to do and took only about 20 minutes before we all had it set up and ready to go. The speakers are right near your head so even if you are watching a movie or forced to game while your crazy family is playing cards at the coffee table you can still hear everything that’s going on in your game. The padding is soft and comfortable and easy to wipe down in case of a spill. Some users reported the chair slumped over after repeated use. Part of the joy of being a gamer is the ability to experience the world’s’ greatest adventures and stories, without having to leave the comfort of your room/living room/friend’s house. Do I need back support? How wide is the chair and can it hold my body with comfort? Also be sure you are taking a look at product reviews so that you can see what other users said. In summary, be sure your gaming chair has the support and sound you need to be the best at your game of choice.